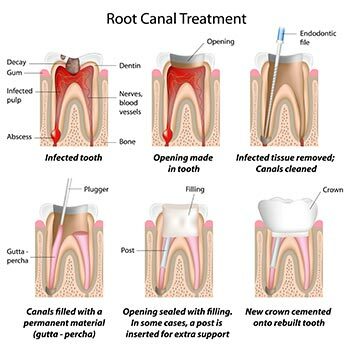 Root canal treatment is a standard technique that treats tooth infections and inflammation. At his Woodland Hills, California, office, Dr. Alexander Visot offers simple, effective root canals to address a wide variety of oral health issues. You can pick up the phone or use the online scheduling tool to learn how Dr. Visot and his friendly, caring staff guide you through the process of getting a root canal that can spare you pain, not cause it. Root canal procedures can help save your teeth. If you have inflammation or an infection affecting your teeth’s roots, you might need a root canal. During a root canal, Dr. Visot removes the inflamed or infected pulp inside your tooth. He then cleans, disinfects, and reshapes the root canals before finally placing a filling to seal the space. In many cases, you return to Dr. Visot after a root canal to receive a crown or other restoration for the treated tooth to help protect it. Restoration also helps the treated tooth regain its normal function quicker. Later, the tooth functions just like a natural tooth. Swelling and tenderness in nearby bone and gum tissues. Sometimes, however, there are no symptoms, and regular checkup with Dr. Visot can help determine whether or not you need a root canal. X-rays and other diagnostic testing help him evaluate your overall oral health and potentially discover inflammation or infection to the nerve roots of your teeth. Dr. Visot uses modern techniques and anesthetics to ensure that you’re comfortable and feel as little pain as possible during the procedure. During the days directly following treatment, your tooth may feel sensitive, especially if you had an infection before the procedure. Dr. Visot can help relieve any discomfort you feel by prescribing over-the-counter or prescription pain medications. Your treated tooth will probably feel different from your other teeth for a while after your root canal. If you experience intense pain or pressure or pain that persists for more than a couple of days, make an appointment to see Dr. Visot for additional pain relief. If you’re experiencing tooth pain or sensitivity, make an appointment with Dr. Visot right away to find out if a root canal can help you.